Custom Beach Mats with Pillows Personalized in Bulk. Promotional, Inexpensive. Budget Prices in the USA and Canada. Bulk custom imprinted Beach Mat with attached inflatable pillow folds into a large tote with shoulderv straps! 3 items in one: ideal beach accessory! We also supply wholesale blank (not imprinted) Beach Mat Totes. 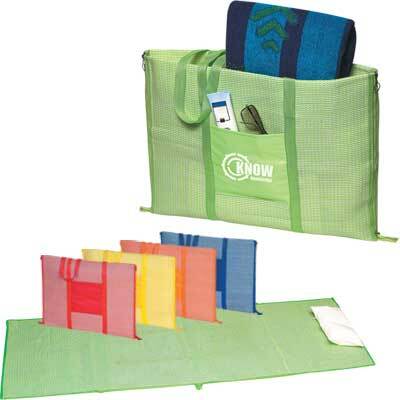 Budget Prices in USA and Canada for wholesale promotional Beach Mat Totes. American clients pay no taxes.